The S&P 500 gained 34 points or 1.3% on Friday. A very positive day boosted by trade talk optimism and waning concerns about the U.S. economic outlook. Futures trade vs fair value were lower late last night - Dow -170, S&P -18, Nasdaq -62, Russell -11. Keep an eye on the VIX - The Vix has stayed under 20 few awhile now and it appears it is signaling that buying the dips is back along with taking on risk. We are back above 2,600 on the S&P 500 AND the 50-day MA - That level is now support on any pullbacks or dips. In corporate news, Tesla (TSLA 302.26, -45.05) was a story stock after it dropped 13.0% following plans to reduce its full-time staff by approximately 7%. The company hopes that the reduction could help it produce its Model 3 at a more affordable price point for the masses. Tiger's Take: "Good luck with that - avoid trading in this stock." 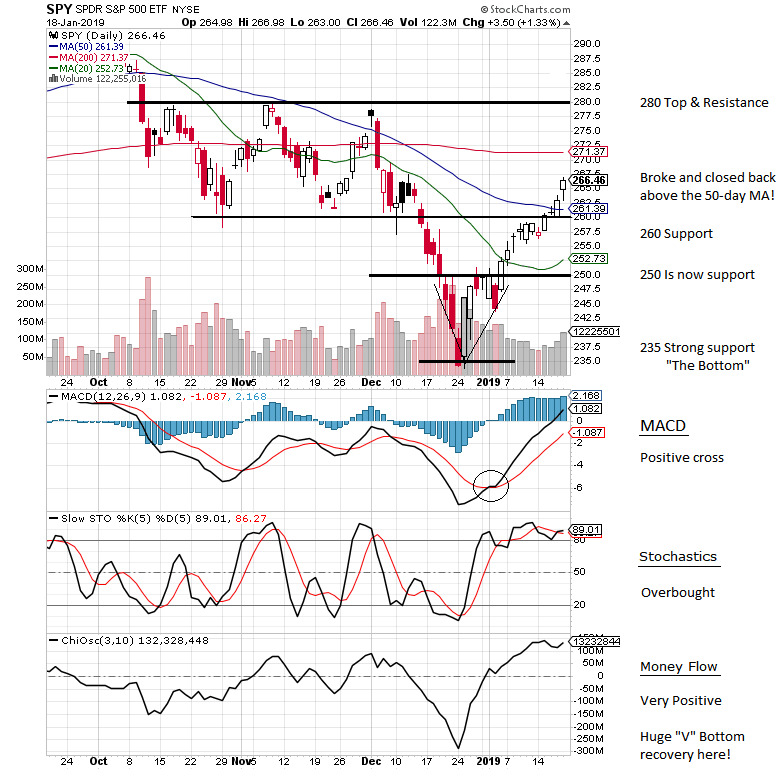 The markets finished higher Friday closing for a second day above the 50-day MA on the SPY. This is very good for the bulls. The Vix remains a bit high still, keep an eye on it. It appears we are entering a new trading range of 260 up to the 200-day MA (271.37). The futures were a bit lower early this morning, we could see a little pullback but I expect the 50-day MA and the 260 level to be good support.